The only good things about winter are snowboarding, snow, hot chocolate and soup. In no particular order. Everything else is just meh. Ok, ok, those aren’t the only good things. Some people hate on winter (like the Starks a la Game of Thrones…I’m still weeping over Ned Stark. Oh, and Rob Stark. And Catelyn Stark…basically, all the Starks and the long list of characters which fell prey to the GOT bloodbath), but I actually love all the seasons. I’m a hippie at heart, and each season brings with it some amazing outdoor playtime. D.C. winters are pretty mild (now that I’ve written that, the weather gods are probably going to send a raging snowpocalypse on the DMV area), but my husband Samuel and I get our fill of winter, because we usually go skiing at least two or three times a month to some of the surrounding resorts in-between our trips to Colorado. We love the snow so much, we would build an igloo and camp out if we could. I’m probably going to be featuring non-stop soup recipes since 1) I live on a steady diet of soup and wine in the winter (the Wine Diet is year round, let’s be real) and 2) my sweet husband was hit by a pretty bad cold this week, so I made him homemade chicken noodle soup (I’ll feature the recipe later this week or next). I always use the leftover bones of the chicken to make a big batch of bone broth, because the health benefits are cray. 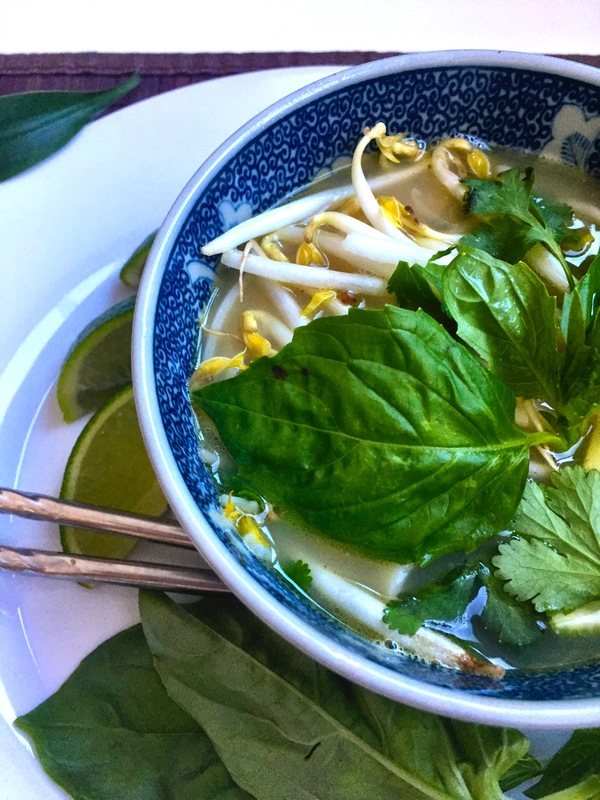 I made this authentic pho recipe with beef bone broth, which is NOT vegan or vegetarian. If you don’t want to use bone broth, sub homemade vegetable stock instead. I personally make an exception on this, because bone broth is so beneficial for autoimmune diseases. This is huge for me, because I’ve been able to control my Lupus through natural measures for years. I personally feel a difference when I consume bone broth and take tumeric daily. Why does bone broth boost the immune system? 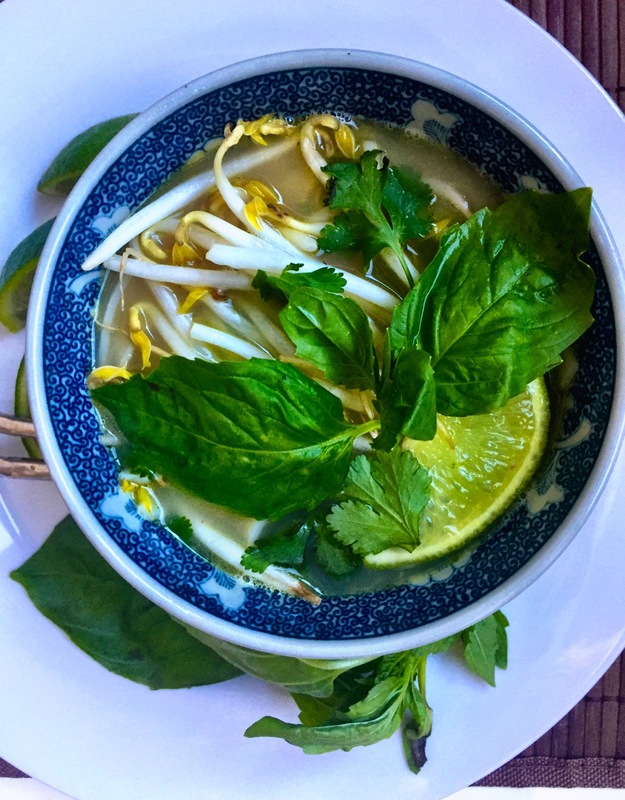 Due to the high concentration of minerals, bone broth is a “superfood.” A Harvard study even showed that people with auto-immune disorders experienced a relief of symptoms when drinking bone broth, and some achieved complete remission. This is a big winner for athletes and people with autoimmune diseases. My husband and I are pretty extreme athletes: we ski, snowboard, do HIIT classes and other intense workout training, run…I mean, these things are great, but they can be inflammatory for the body. Taking glucosamine supplements to help with joint pain has been common knowledge for years, but it turns out that bone broth has glucosamine too. Bone broth is so beneficial, it’s a diet requirement for the LA Lakers. So why broth and not pills? The broth includes a host of other benefits that help keep your joints happy, healthy, and pain-free. The chondroitin sulfate in bone broth has been shown to help prevent osteoarthritis. According to Jill Grunewald, a holistic nutrition coach and founder of Healthful Elements, a cup a day works miracles for leaky gut syndrome but it’s also good for protecting non-leaky guts. The gelatin in the bone broth helps seal up holes in intestines. This helps cure chronic diarrhea, constipation, and even some food intolerances like Celiac and Crohn’s disease. PRAISE BABY JESUS. I’m down! Bone broth is a rich source of collagen. You can find collagen in all kinds of “plumping” products these days. Drinking it is not only cheaper, but it can make your hair and nails look just as radiant as your skin. The phosphorus, magnesium, and calcium in the bones seeps out into the broth and gives your body the building blocks for healthy bones. The glycine in bone broth has been shown in several studies to help people sleep better and improve memory. There are a slew of other benefits, but those are some of my favorite. Anyway, my dear friend from Vietnam taught me this authentic recipe, and she shared the tricks of the trade to really nail it. Did you know pho is actually a breakfast food? True story. It’s so delicious, I could eat it morning, noon, or night. OPTIONAL: 1/2 pound raw eye of round or sirloin steak, thinly sliced across the grain. It’s traditional to add to bowl raw, and to pour hot broth over it, which cooks it. I don’t eat meat, so I can’t really testify to how this portion tastes. While noodles soak, move an oven rack to a high position then turn broiler to high. Line a baking sheet with aluminum foil. Place quartered onions and halved ginger onto baking sheet then broil for 10 to 15 minutes, turning onions and ginger occasionally so that they become charred or browned on all sides. You can also sauté them, which is faster and does the same thing. TIP: An added bonus: you can throw in a dab of butter and lightly sauté your rice noodles afterwards to give them maximum flavor in the soup. Add cinnamon sticks, cardamom seeds, fennel seeds, star anise, cloves and the black cardamom pod to a dry frying pan. Place onto low heat and cook, stirring occasionally until fragrant. About 5 minutes. Place toasted spices into a cotton muslin bag/herb sachet or cheesecloth then tie with butchers twine to seal. Pour bone broth into stockpot and bring boil. Add charred onion and ginger as well as the bag or sachet of toasted spices, then bring to a simmer. Add 1 1/2 tablespoons of salt, a 1/4 cup of fish sauce and the rock sugar. Continue to simmer broth, uncovered, for 15 minutes. Pour broth over noodles (and beef, if used), top with fresh basil, bean sprouts, etc. and serve. Note: The secret to great pho is two parts: a delicious stock, and charring the onions/toasting the spices. This really enhances the flavor profile of the soup. After you’ve made this soup a few times, it’s easy to prep and serve within 15 minutes if you multi-task. Making your own bone broth takes TIME. And I mean several hours worth of it. It’s not difficult to make, however, and you aren’t tied to your stovetop like you’d expect. Most grocery stores and markets sell ready-made bone broth, or you can even buy it on Amazon.com. The online prices range from inexpensive to very pricy, so I’d encourage you to do a little research about whichever brand you select. If you love soup as much as I do, I definitely recommend this recipe. It’s light, delicious, and it absolutely hits the spot.